Seattle’s crane count has surged in the last year, overtaking New York as the city with the most such construction rigs transforming the urban landscape. Seattle is — for the moment, at least — the crane capital of America. 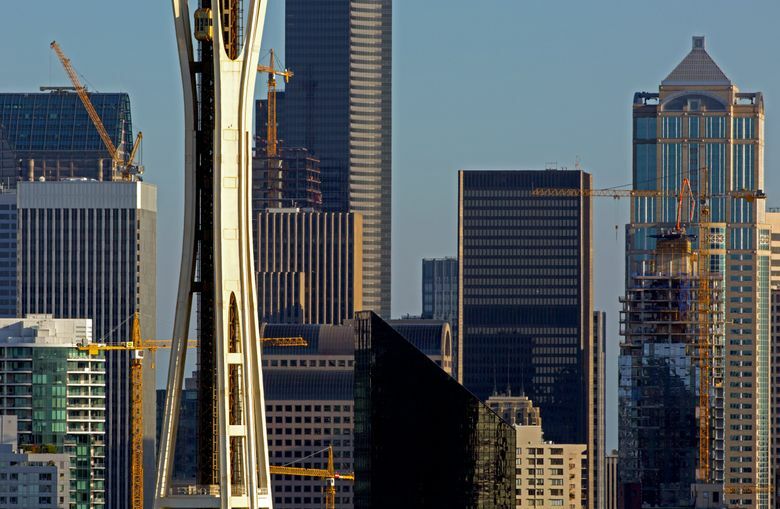 As the city transforms with taller and taller buildings, Seattle this summer had 58 construction cranes reshaping the skyline — more than any other city in the country, according to recent data. The city has more cranes than New York and San Francisco combined. It has twice as many as Chicago, Washington, D.C., or Portland. And it has an 18-crane lead over second-place Los Angeles, according to Rider Levett Bucknall, a firm that tracks crane counts across the world. Seattle’s crane count has grown 38 percent in the past year, creating a shortage of both cranes and operators. And while they’re most tightly concentrated in downtown and South Lake Union, the cranes are soaring hundreds of feet above neighborhoods from Sodo to Fremont to the University District. The towering yellow construction equipment is the most visible sign of Seattle’s ongoing makeover — for better or worse — as developers across the city continue to build apartment and condo buildings, new offices and hotels. Just in downtown, the number of major buildings under construction has quadrupled in the last five years and is now at a 10-year high, while forecasts for future development indicate the frenzy won’t be slowing anytime soon. Cranes usually stay up for six to 18 months, depending on the job. Tim O’Neill, a project executive for Skanska, which does major construction projects in Seattle and around the world, said the wait time for a crane locally is now eight months, about twice as long as normal. A crane can cost from $15,000 to $55,000 a month, depending on the model, and despite the boom those prices have only gone up a little, he said. The many cranes punctuating the skyline don’t simply move from one site to another. Each has to be sent back to the supplier after every use for testing, and the cranes around Seattle have come from across the country. Reserving a crane is now like trying to get a table at a hot new restaurant: You have to put your name in and wait. Taylor Mayfield, whose Mayfield Hoisting Service provides cranes and operators locally, said he’s already taking reservations for projects that will need cranes next April. “As soon as they come down, they go right back up” after testing, Mayfield said. “Some of the ones you see on the skyline have already got contracts” scheduled for their next job. Some of the cranes are so close together, especially in downtown and South Lake Union, that crews now have to dance through a sort of synchronized crane ballet to avoid hitting one another with the long horizontal arms. Developers also have to secure air rights over other buildings and coordinate with the Federal Aviation Administration, which oversees flight paths. Beyond the physical impact of the cranes and the related construction work — thousands of new housing units and jobs, plus temporary headaches for anyone navigating past the numerous building sites — they’ve come to symbolize how the city is changing. That’s what inspired Chamberlain to come up with her crane art display after the Downtown Seattle Association put out a call to fund new public art. It features a dozen colorful light-up cranes affixed to trees 11 feet in the air, poised above visitors eating lunch or playing games. In some spots near downtown, it’s possible to spin around and see a dozen or more cranes. From certain vantage points, they sometimes frame the view of the Space Needle. They’re one of the first things people see when entering Seattle, whether by freeway or ferries. 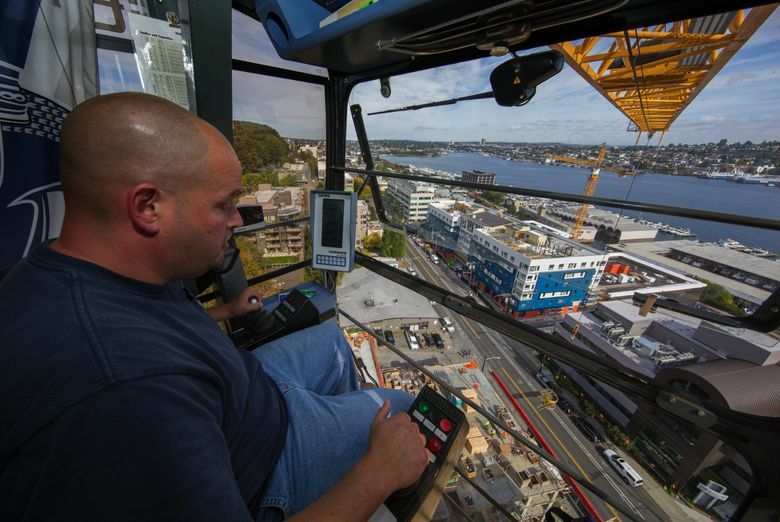 Haider, who’s currently a crane operator for a mixed-use building near Facebook’s new outpost on Dexter Avenue North, grew up in the area and has had a unique vantage point in his cab above the city to see the transformation. The Rider Levett Bucknall data, which looks at all tower-crane types, doesn’t go back far enough to show whether Seattle has surpassed its crane count during the last building boom, in the middle of last decade. But there was a crane shortage then, too. There’s also no data to know whether Seattle had ever previously been the nation’s crane leader. Compared to a year ago, Seattle gained 16 cranes, while the average U.S. city lost two, although much of that drop occurred in New York, which had led the country in crane counts last year. The majority of the tall buildings going up in Seattle are for apartments and condos, though office buildings for Amazon and other companies, as well as a few hotels, are also under construction. Sometimes big public-works projects require cranes, too. A crane could be required for buildings as small as seven stories — though for high-rises, some wind up rising 600 feet or more in the air. Some jobs even require multiple cranes. Seattle isn’t the only local city building up: As of the beginning of this year, there were about 20 cranes on the Eastside, according to Rider Levett Bucknall. In Bellevue, developers launched 29 projects requiring cranes from 2013 to 2015 after having only 11 in the previous two years, according to city officials. Bellevue spokesman Brad Harwood said the current boom has lasted longer than the previous construction surge before the recession. But there are signs the boom is starting to at least level off. Seattle has lost two cranes from the skyline compared to earlier this year, and Bellevue so far this year has added only two new projects requiring cranes. 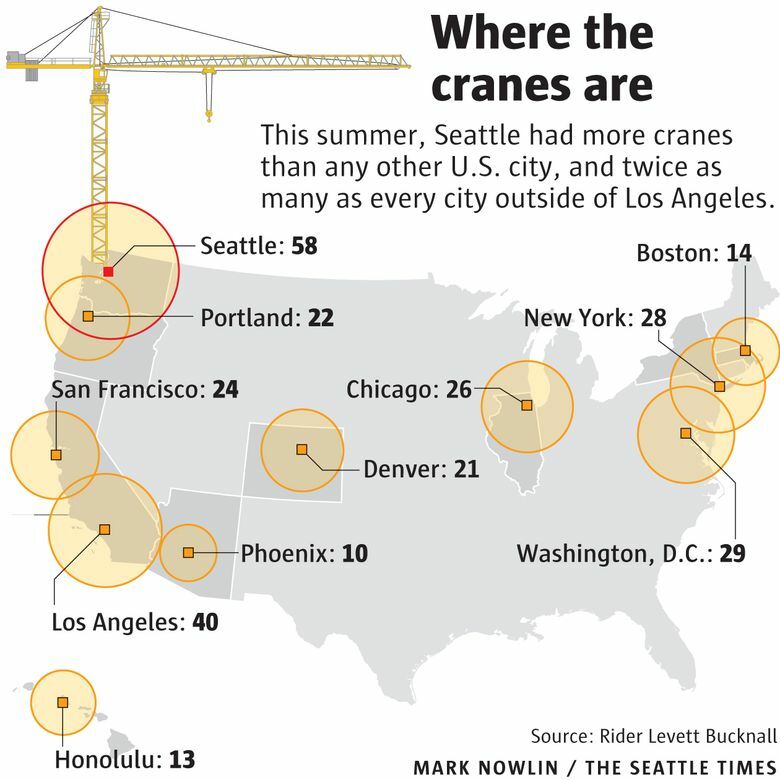 And Seattle still has a long way to go to get to the top of the global crane standings. Internationally, cities tracked by Rider Levett Bucknall that have far more cranes than Seattle include Toronto; Sydney, Melbourne and Brisbane in Australia; and Dubai and Abu Dhabi in the Middle East.